The Cape Overberg has a magic all its own and has much to offer visitors. 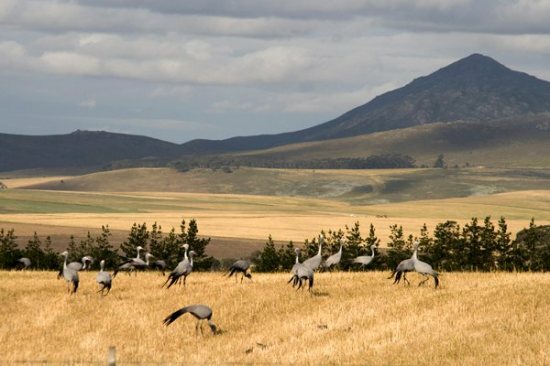 Rolling wheatfields with Blue Cranes amongst grazing sheep, against a backdrop of mountains. Near L’Agulhas the two great oceans meet. All along the coastline are long white beaches and many rock pools to explore. Numerous ships have foundered on the treacherous rocks and a couple of wrecks can still be seen along the coast. Whales come here every year to mate and calve, and from Hermanus New Harbour and Kleinbaai Harbour whale watching, as well as shark cage diving boat trips are launched. Scuba-diving trips are also offered. Or visit the “Drupkelder” cave at De Kelders, also a popular whale-watching spot, which borders on the Walker Bay Nature Reserve. At nearby Klipgat Cave evidence has been found of human habitation going back 2 000 years, part of the Overberg’s rich cultural Bushmen and Quena (Hottentots) history – the people who inhabited the area for ages before the Dutch settlers arrived in the 17th century, and was displaced by European farmers and missionaries. The oldest mission station in the country, Genadendal, is situated here, as well as the third oldest European town at the Cape – Swellendam. Elim, another mission village, was founded by the Moravian Church in 1824 on the Agulhas plain. After 1838 it became a haven for freed slaves, and a monument to them – the only one in South Africa – was erected here in 1938. The village still belongs to the church and has been declared a heritage site in its entirety. Geelkop Nature Reserve is located on a hill just outside the village. The Overberg villages and towns there are museums and historical buildings, and also many quaint shops to browse – selling anything from serious antiques to collectible junk. There are award winning cheese makers, a micro brewery, numerous wine farms where excellent wines are produced. The region also boasts olive farms who produce their own olive oil. There are many craft shops selling local craft, art galleries, art routes and excellent restaurants, like Marianas, Stormsvlei and more. At Stanford various boat cruises are offered down the Kleinrivier. The river is also popular for canoeing. Die Plaat, a long white sandy beach in the Walker Bay Reserve, is popular amongst anglers (4×4 required). Along the gravel road towards Gansbaai and Grootbos Nature Reserve, the most southerly indigenous afro-montane forests, notably at Platbos – one of the Overstrand´s best kept secrets, can be found. From the exterior, no inkling is given of the age-old trees found within the forest canopy. Nearby Baardskeerdersbos (“Beard Shavers’ Bush”), is home to one of the best Boeremusiek bands in the country. For long it has been a forgotten corner, enshrouded in stories about the inhabitants. In the past few years it has attracted many “outsiders”, and now also hosts a popular Art Route featuring local artists and crafters. This entry was tagged accommodation, birding, cottages, dormer, farm, fynbos, Landmeterskop, merino, mountain biking, Overberg, picnic, sheep, Stanford. Bookmark the permalink.